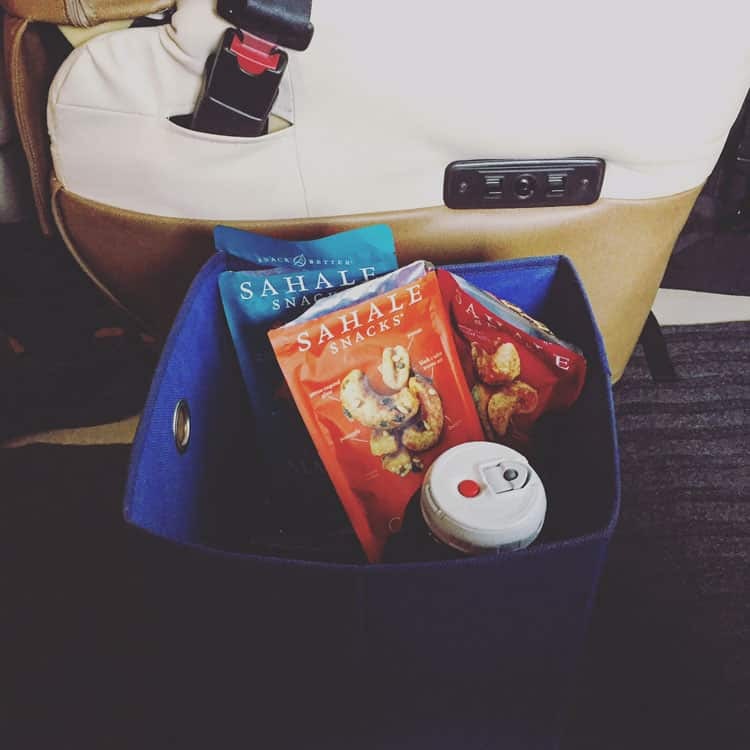 DISCLOSURE: This post is brought to you by Sahale Snacks. 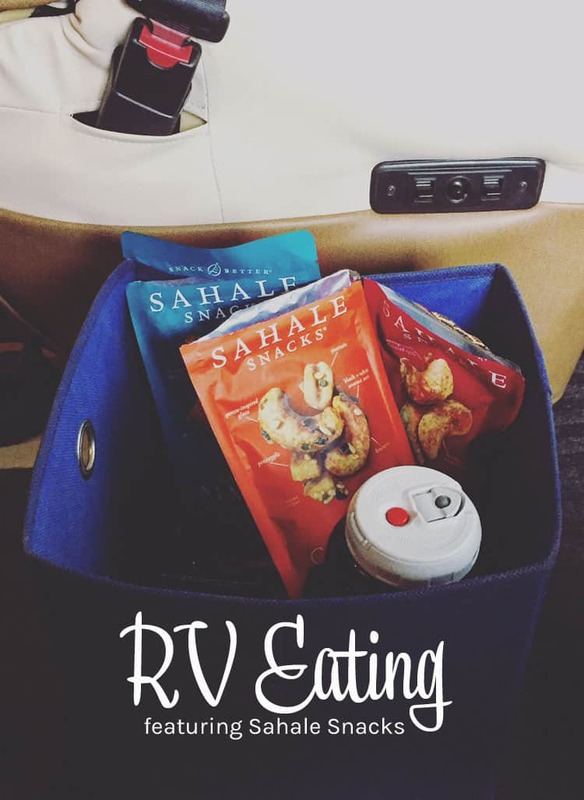 All opinions and food I eat are of my own choosing, but Sahale Snacks is seriously a huge part of our life! 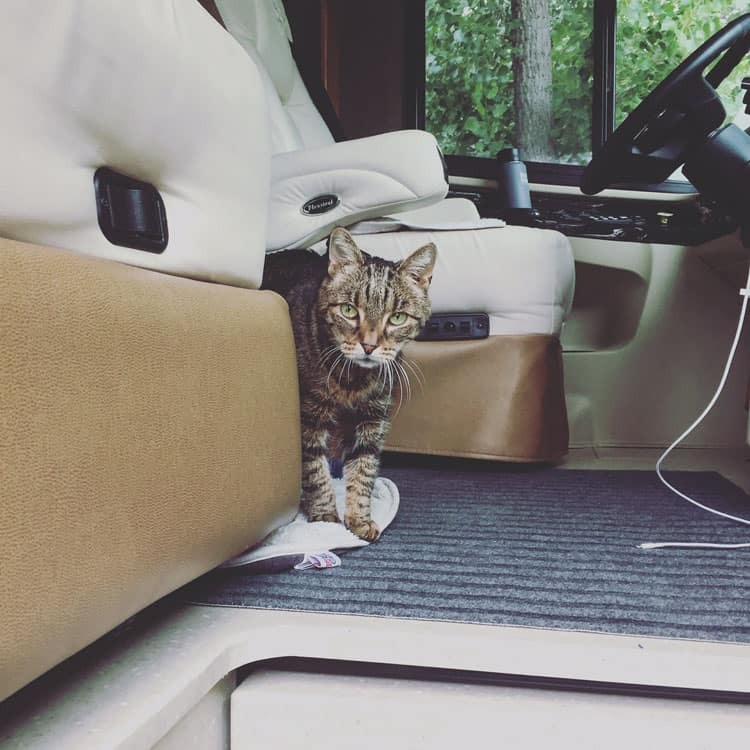 As promised when I wrote my original RV Eating post, I am bringing you an update about the trials and tribulations of our eating life on the road. Food is still a huge focus for me, it’s just the manifestation of how we eat that has changed. Being in the Pacific Northwest and having access to so much fresh food has been a game changer these past few months. The incredible bounty of fruits, nuts and seafood has been a joy! Our daily schedule is decided by what is going on from a photography perspective and that depends on several factors, most importantly, the weather! So here’s what we’ve been eating. When we’re not out early for a sunrise shoot then either eggs (I love eggs!) or bagels are still our mainstay. 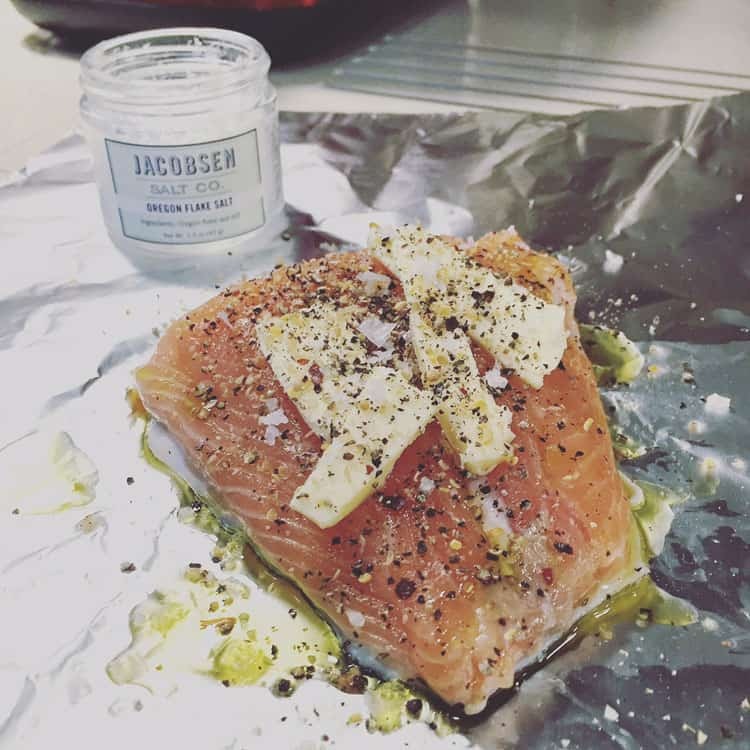 There is a large variety of salmon in the region and we’ve tried lots of different smoked versions which are perfect for our morning bagels. We add fresh slices of tomatoes as well, we try to get fruit of veggies into every meal. Mr. Misadventures is not a huge fan of pancakes, but I am! So when the hubby goes out for a morning shoot alone, I make myself a special treat. I use whole wheat pancake mix and add sliced bananas. Then I crunch up Sahale Snacks Honey Almonds Glazed Mix or the Maple Pecans Glazed Mix. I make a couple of pancakes with a cup of coffee and I am one happy girl! Many times I wish I had my waffle maker in the RV because I think this banana honey almond thing would be great as a waffle, I would throw in a piece of turkey bacon as well. Is it weird that I like be my pancakes and waffles without syrup? For mornings we are out and about capturing the sun making its way into the world, convenience is key. And speed. I prep breakfast the night before so I can have every precious moment to sleep! We do bagels and salmon. Or I’ll also do a bagel with egg. 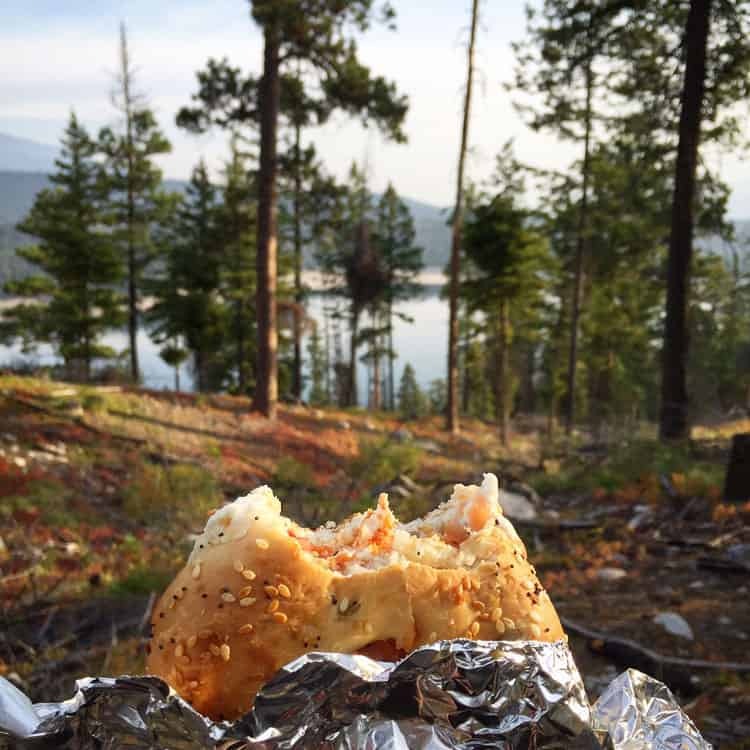 I can tell you, there is nothing better than having a lake, or river or mountain-side “table” for eating any meal. Fresh air is amazing for the digestion! But with the (hot!) summer weather, I’ve been doing a lot more yogurt bowls. The Frenchie likes his with muesli, but I prefer either whole grain granola or fruit and nuts or both. 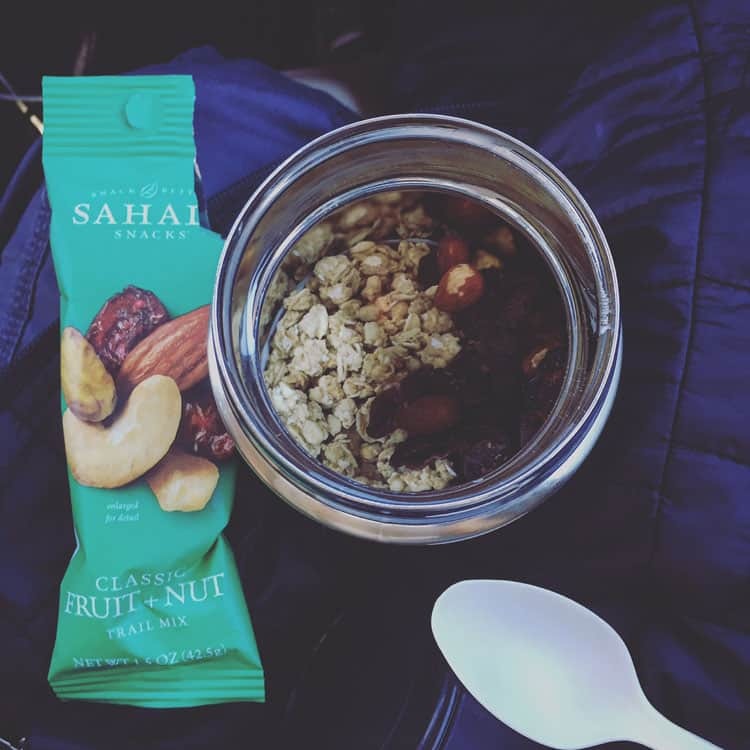 My Sahale Snacks Classic Fruit + Nut Trail Mix Grab & Go Snack are the perfect quantity for my Zojirushi container (it’s the same brand as my amazing rice cooker!). I pack whatever flavor of Greek yogurt I want, a Grab & Go pack and a spoon and pour it in when I’m ready to eat. On cold mornings I’ve started making steel cut oatmeal and pouring my fruit and nut mix in the same way. What’s your favorite go-to breakfast? Does it change depending on what you are doing? We eat a variety of salads for lunch. I try to incorporate leftovers we may have had from dinner. Or cook extra items when we BBQ. Like bbqing some fingerling potatoes (it gives them a light smokey flavor) and adding some canned smoke trout (for smoke on smoke) or sardines with cornichons for a sour element and celery for crunch. We do pasta salads with tuna, celery, sundried tomatoes, dried fruit, and nuts or seeds. I use whole wheat pasta or orzo, or sometimes Israeli couscous. Whatever I make, it has to be interesting. I want lots of flavors and textures. We make a lot of cold soba noodle lunches. The buckwheat noodles are delicious hot, but we love them cold with sesame oil, tamari and wakame or bonito flakes. Mr. Misadventures makes a pickled cucumber salad which goes perfectly with the noodles. For extra protein, I sometimes throw falafel on the side. Having such a large variety of fruits, particularly berries has been wonderful. It’s a perfect ending to our picnics! When we are at “home” then one of my favorite salads to make is a beet salad. It’s too messy for a picnic because the beet stains everything, but I make this when we are staying in. I take beets and goat cheese with a bit of arugula and instead of walnuts, I use the Pomegranate Flavored Pistachios Glazed Mix from Sahale Snacks. The tartness of the lemon in that mix adds packs a punch into this salad and I love it! Another salad I do at home because it is a little on the messy side is particular version of tomato salad. We slice fresh tomatoes add in cucumber, or avocado, or just the tomatoes alone. Then we open up a can of sardines and use the oil for the salad. I add balsamic vinegar we brought back from Florence for my salad and the misters adds apple cider vinegar for his. 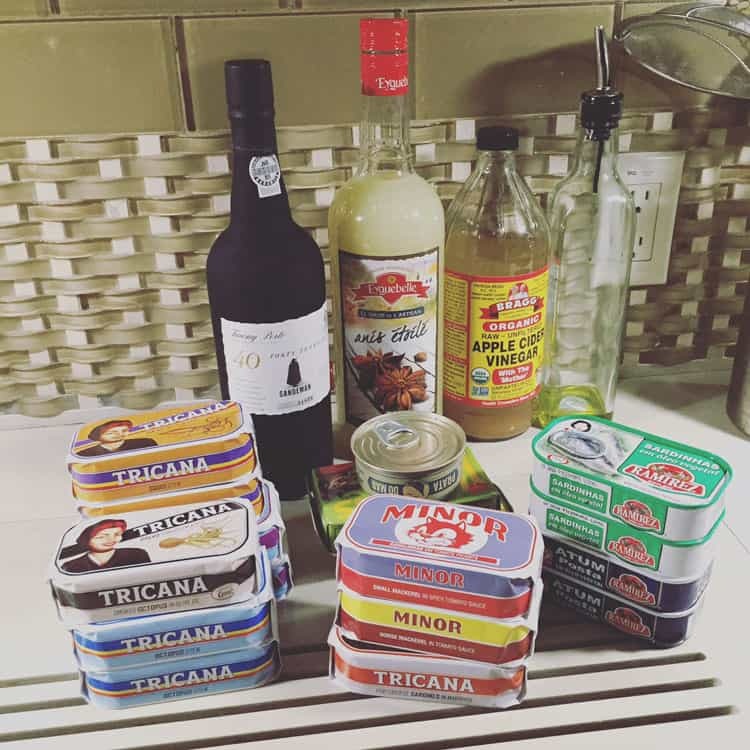 We just recently realized that the sardine oil is perfect to replace the olive oil we usually use in the salad. I shed a tear for all the sardine oil I previously threw away! 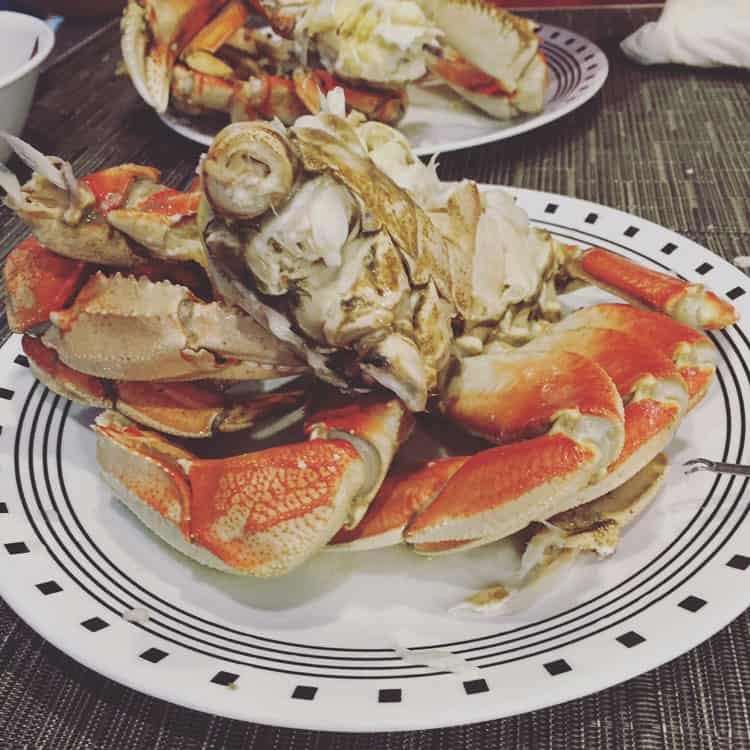 The past few months we’ve been eating a lot of fresh Dungeness crab. We’d buy three and dive in. Nothing else, just the crab. It is so sweet ant delicious, satisfying with without sauces or side dishes. Is there a seasonal food that you look forward to every year? Fish! Gloriously fresh fish! As we traveled around we bought whatever was the freshest from local fish mongers and markets. I never had much of an appreciation for rockfish or halibut until I had it super fresh and simply cooked. It is outrageously good! We ate it practically every day for weeks. Along with salmon. We’ve always eaten a lot of salmon, it is a favorite of Mr. Misadventures, but I never knew there was so many different types of salmon available on the west coast. We had coho and chinook and sockeye and keta. Oh my! Before our trip my favorite way to eat salmon was raw as sashimi (my ulta favorite being it’s eggs, ikura! ), but simply grilled on the bbq or skillet when it is so fresh has no comparison. I realize that I have both olive oil AND butter in the photo above, but do recall I live with a Frenchman, they love to double up on their fats. We don’t add butter every time, just every once in awhile! Eat life to the fullest! Our friends Esther and Jacob reminded us how much we love Japanese curry. We had a wonderful dinner with them while visiting Colorado. We brought the sausage and rice, they brought they curry. So now we make big batches of it and eat it over several meals. We make ours with lots of veggies. Our friends Ilyse and Denise reminded us how easy it is to cook with Thai curries. We had a lovely dinner (one of many with them when we spent nearly a week on the Oregon coast together) with green curry vegetables. So I’ve been making vegetable and meat curries in all the colors – red, green, yellow! We also still make udons and sobas and ramen, I swear we were Asian or Japanese in another life! Is there a particular food culture you gravitate toward? 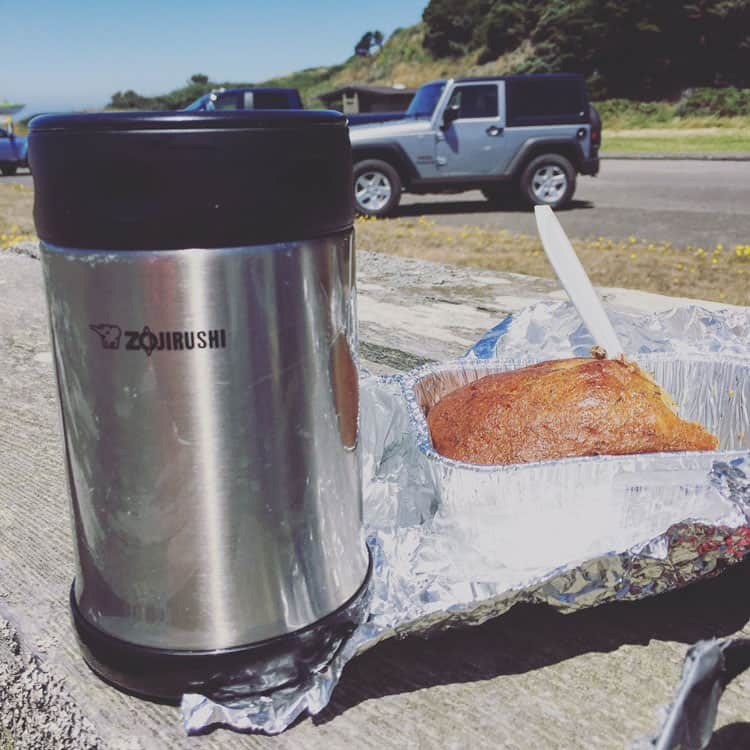 During our time in the Southwest states and national parks I was really missing the diversity of food that was at my fingertips in San Francisco. I hoped once we got into the Pacific Northwest (and Northwest in general) there would be an opportunity to eat from the world’s table. I was not disappointed. We ate Thai, Vietnamese, and offerings from other food cultures and my food soul was nourished. That is the other reason why I love Sahale Snacks. I can have Thai cashews with notes of sake, rice wine vinegar and lemongrass or Balsamic almonds with vinegar and black pepper flavors and I feel satisfied. Not only because I know the ingredients are prime, they are curated with such care, but also it provides me with a culinary experience. One I have with every mouthful. That’s why the vast majority of our snacks are some variety of Sahale Snacks. You will find them everywhere. Glove compartment. Backpacks. In our “driving box” when we are on the road. These snacks complete me. I am an unapologetic gourmand and I love the combination of flavors and textures, I am never disappointed. 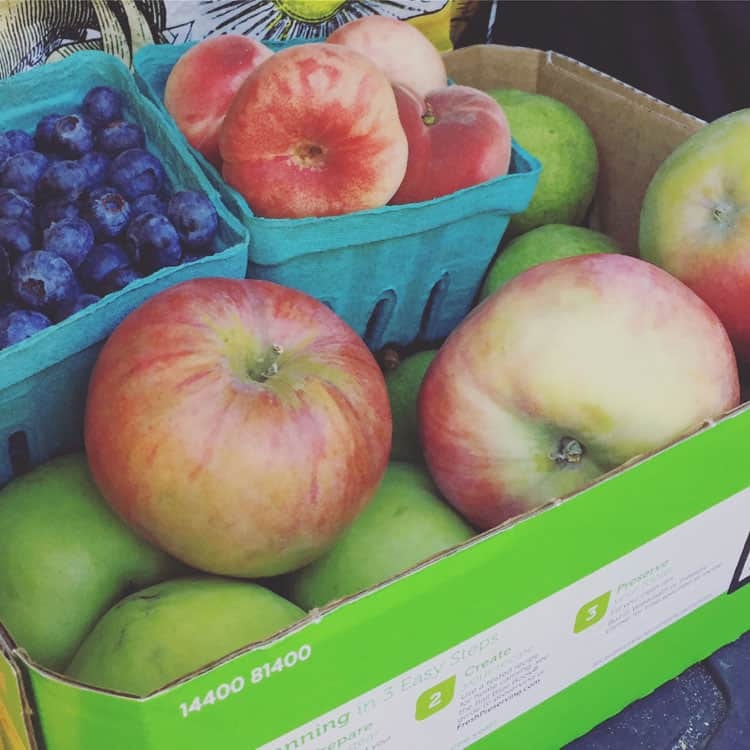 Of course we also take advantage of the plethora of fresh fruit that has been available recently, I will miss them all once winter arrives! The answer may be banana bread! We can’t resist my mother’s banana bread. Last time we organized a mail shipment, we asked her to send us some. We had a freezer full of loaves, but we’ve finally depleted our supply. Other snacks include cheese, local ones if we can find them, and wasa crackers. We also have a nice little supply of French pâtés and rillettes. And I’ll admit, I also eat Pirate’s Booty, peanut butter pretzels, Ikea oatmeal chocolate cookies and black licorice – hey I am human too! Ah this little pain in the caboose. We don’t have access to the natural pet stores we did while living in the Bay Area so once her supply ran out and we realized her cans were too heavy to ship, I had to find an alternative solution. Most of the time you can find the two major retail chains for pets starting with a “P” so I found a natural canned food there where the ingredient list didn’t make me gasp. I bought one of every flavor. Each time I gave her a can she devoured it, so I felt like it was a success. I gave her cod, then a salmon and cod combo, then turkey, then duck, then chicken. I thought, “great!” I went to the store and bought a several-week supply of them, not realizing that once she tasted the chicken it was over, she was done with all the other flavors. She wouldn’t eat any of them! So I had to take all the other flavors back and exchange them for chicken. Winner, winner, chicken dinner, the girl is boring! What do I really miss when it comes to food? I don’t miss bread anymore. I still miss sushi. I get cravings for Asian food. Avocados. And cold pressed juices. Fried chicken, I want a good fried chicken dinner. I am not a big fan of fried food, but I want some chicken! DISCLOSURE: This post is brought to you by Sahale Snacks, I have always loved Sahale Snacks, they are an integral part of my eating life. Despite the fact that I was a Sahale Snacks ambassador, I loved them before that assignment and I continue to love them. This is what I really eat, no joke, and that includes Sahale Snacks. Bottom line, all opinions are my own. This is making me hungry. I love they focus on food and RVing. Wow these are some awesome recipes and staples for great meals on the road. All of these look so delicious! Great and healthy ideas. I don’t make meals, I usually eat out or buy something. That Asian food looks good, I differ with you on eggs, never liked them. Lovely! It’s so nice to eat fresh produce, wherever you are. I like that you enjoy every single day, especially with meals together. I enjoyed everything and the pictures are amazing as well. 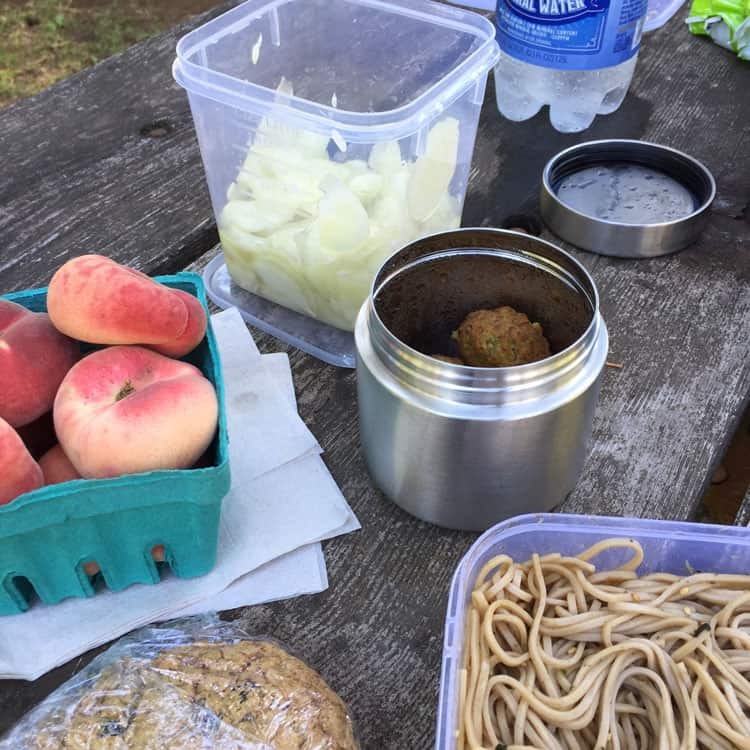 Thanks for sharing your everyday meals! I love these posts! It’s so cool to see that you can live in an RV and not subsist mostly on sandwiches. 🙂 I’m not a huge pancake fan either, but some weekends we do make crepes (they are probably terrible by your husband’s standards), and we eat them flat like a pancake with a sprinkle of sugar and squeeze of fresh lemon juice. Is that weird? They’re delicious! I also make my own granola and often have that for breakfast over plain, whole milk yogurt. For dinners we often make a Thai fish curry (with halibut when we’re feeling spendy, with cod when we’re not) using green curry paste and serve it over coconut rice. So tasty and simple! 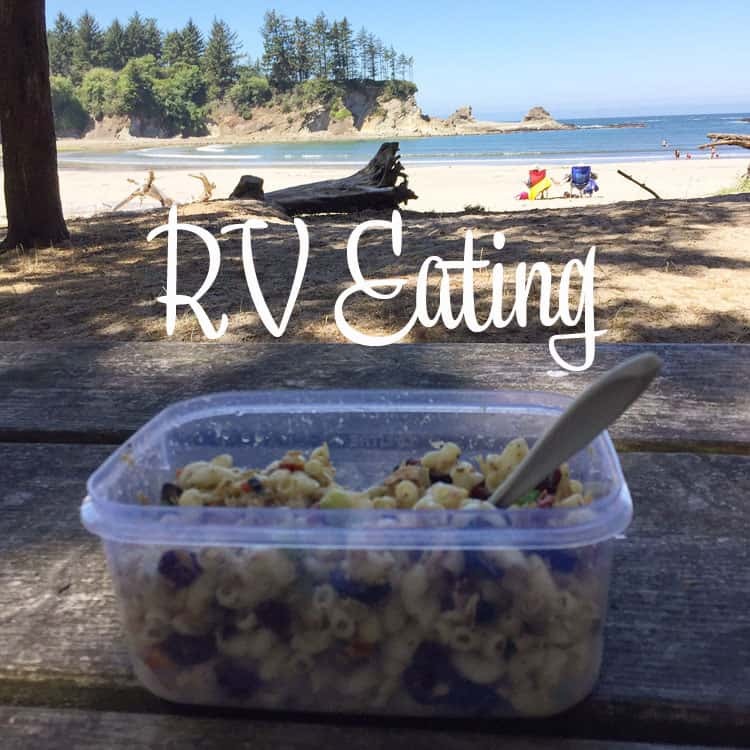 Wow… great post and I love all of the recipe ideas for RVing! You little kitty is adorable as well…. but those granola and nut snack mixes look amazing and I will have to find them for myself! 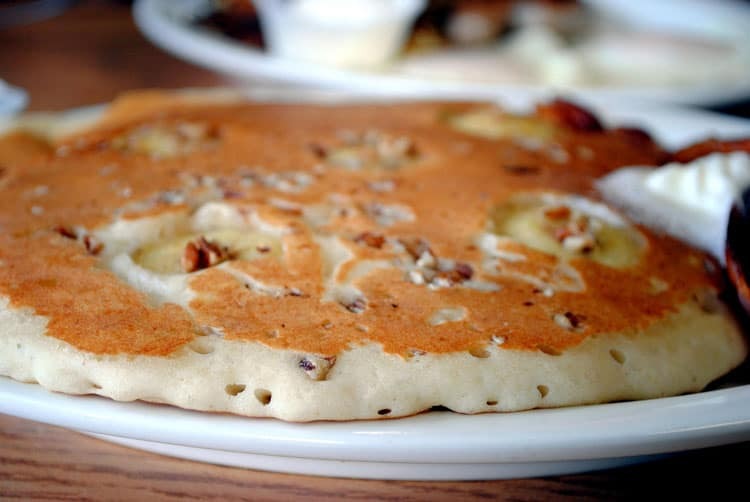 Great review and the pancake with bananas and a little crunch made me seriously hungry! Yum! DroolDroolDrool! 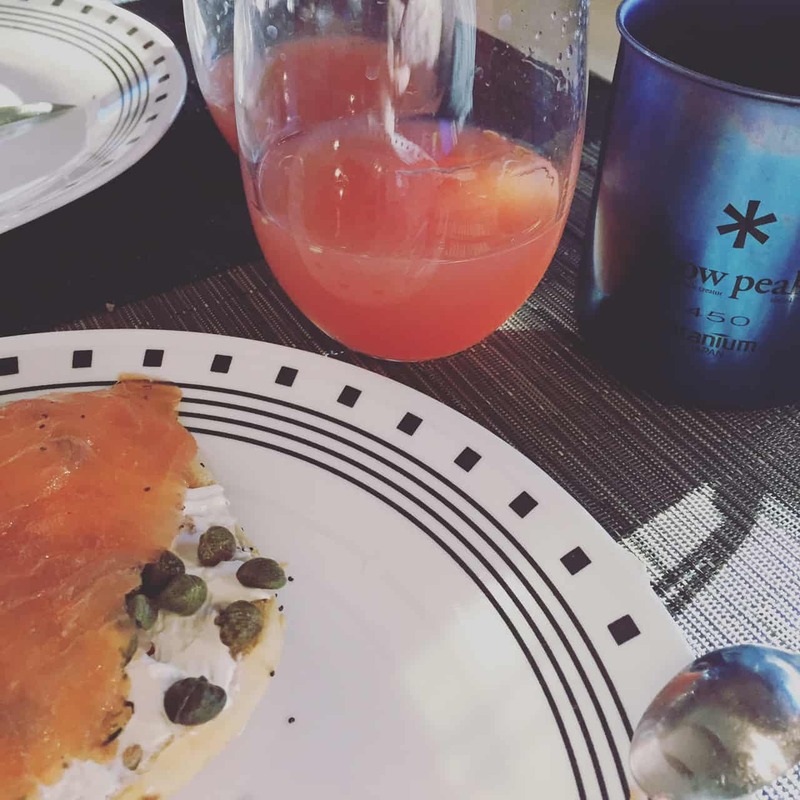 It all looked good but honestly, I couldn’t stop thinking about the bagels and salmon! I’d love to try RV’ing. Thanks for sharing! Wow! I love your foods! I want to on on an adventure like yours, maybe when the kids grew up a little bit. 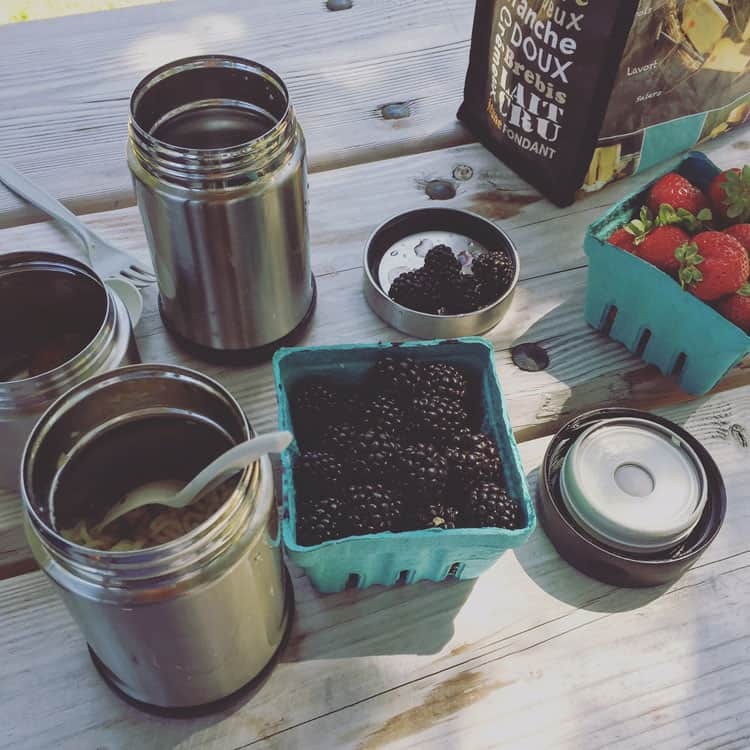 I love bringing foods on our travel, I love bringing fruits more! These are all mouth-watering! Almost lunch time here in the Philippines and all the food photos from this post makes my tummy growl… I love everything in it. I wish we can spend more time like this and enjoy the scenery and the food. Ooooo so much yumminess!!!! I wasn’t exuthat when I read the word RV! All of these look delicious! The trail mix sounds like something I can bring along on my hikes. These are beyond EPIC gourmet looking meals, se manifique and heavenly. My grandparents are looking to get an RV so definitely going to try these with them. those foods looks lovely! eggs is a must in house. usuall foods are made with eggs salmon, beef and some others, your photos looks amazing! All of these look so delicious! 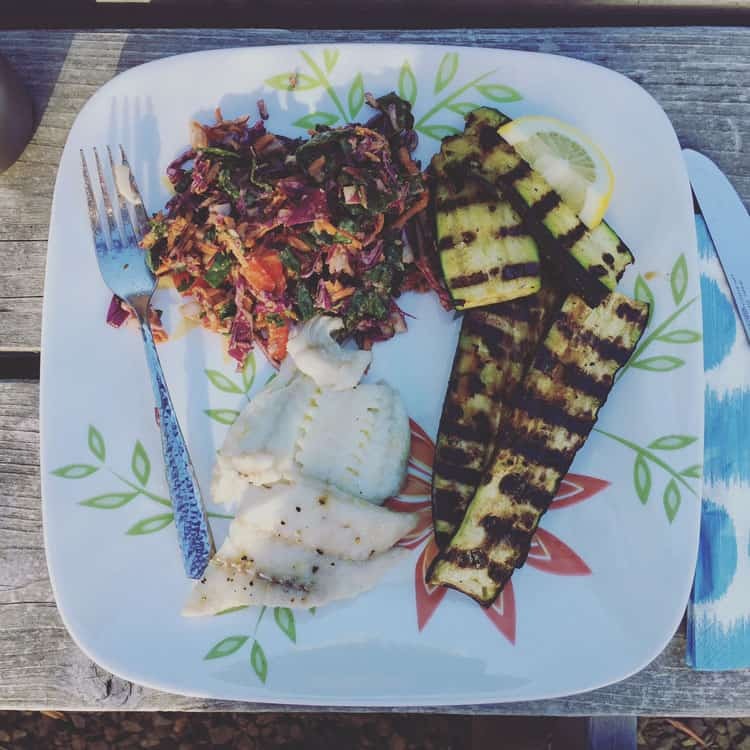 We recently did an RV trip, but I tried to cook as simple as possible! These are great and healthy ideas. First, the food looks awesome and there’s some great ideas there.